Few bands have self-mythologised as astutely as Pink Floyd, or done so with such bold use of visual arts, design, lights and stage theatricality. So it makes perfect sense for the increasingly groovy V&A to follow up their blockbuster David Bowie Is and You Say You Want A Revolution? 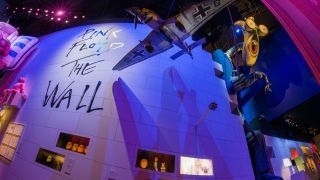 exhibitions with a Floyd grand-scale spectacular, taking you on a colourful trip through fifty years of rock culture. Since their 1967 debut, Floyd have moved from psychedelic wig-outs to stadium pomp, their musical impact indisputable. Yet for all the dazzling props here – the reconstructions of The Wall and Battersea Power Station, the giant inflatable schoolmaster, the silver heads from The Division Bell, Syd’s red bike and a hologram of the Dark Side prism - it’s the intimate personal touches which make this show resonate. Individually, the Pinks might not ooze charisma, but their history of break-ups and make-ups is a terrific soap opera refracted through lasers and lava lamps. As time-capsule telephone booths throughout chart the passing of the decades, we begin with counter-culture articles offering a slang glossary for “the greys” (the middle-aged), including new-fangled phrases like “Freak out!” Freak out we do as we reel from films like Jonathan Miller’s Alice In Wonderland to racks of instruments (a replica of Syd’s mirrored guitar, a bass which Gilmour bought from Waters and still plays) and a room showing how Floyd were among the first to embrace synths and loops on On The Run. Their youth in Cambridge is rather hastily rushed through: a touch more on their formative, pre-London and UFO years might have been enlightening. But the curators want to hurry us towards the money shots, and very swiftly Richard Wright – who amid the eccentricities of Barrett and the warring of Waters and Gilmour emerges as the soul of the band – is revealing (on film) that some of those gorgeous chords in Dark Side were inspired by Miles Davis’ Kind Of Blue. The Wish You Were Here section allows Hipgnosis, who created such crucial elements of the b®and’s mystique, to shine on, exploring “the theme of absence”. That photo of a bald, weighty, unrecognisable Barrett showing up at the sessions never ceases to unnerve. Hipgnosis’ work throughout is sumptuously presented: it’s hard to believe this was pre-photoshop, never mind pre-digital. As Floyd get bigger there are inevitable missteps into bloated indulgence, but this show accentuates the positive. The circular screen which was their gateway into epic live productions arrives – they went from “improvised to preconceived”, observes artist Ian Emes – and along come the flying pigs and evil teachers’ canes. Aubrey Powell recounts that a farmer from Kent complained that the pig, escaped from its moorings, was “frightening his cows”. After the Waters-Gilmour split (politely glossed over), there are ill-advised Miami Vice suits and worse mullets, but the sheer hugeness the name Pink Floyd maintained is conveyed. This culminates in the final room, where a vast multi-screen projection powers out the awkward-but-touching 2008 Live 8 reunion for Comfortably Numb in 3D audio, with actual lasers only surpassed for sensuousness by Gilmour’s guitar sound. It’ll be a diamond-hearted Floyd fan who doesn’t well up at this. Their Mortal Remains is a valedictory river of high hopes and old glory. Their Mortal Remains runs from May 13 to October 1. See pinkfloydexhibition.com for details.